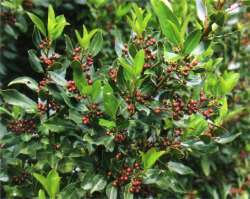 Evergreen shrub up to 5 m tall, or stunted in exposed sites. Flowers Green, small, fragrant, 3-4 mm in diameter, with no petals. Usually in hairy, scale-leaved racemes or panicles. The turned-back calyx lobes are usually red-edged. Flowers May-Nov.
Fruit Glossy dark red, egg-shaped drupes to 7 mm long, turning black. Leaves Leathery, glossy on the top surface. Elliptical or egg-shaped, up to 6 cm long by 3 cm wide. Leaves entire or with teeth that can be blunt or sharp toothed. Stems Young shoots purplish, angled, hairy. Scrub, forest margins and plantations. Common in and around Auckland City and Hauraki Gulf islands, decreasing southwards in NI. Occasional in Marlborough, Canterbury and Otago in SI. Originally from the Mediterranean. 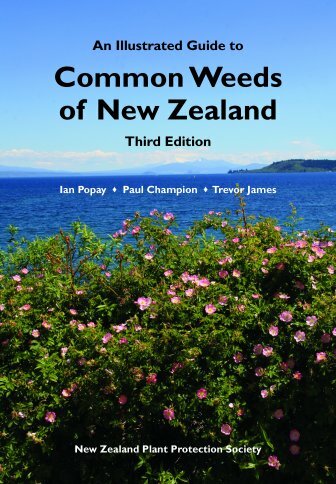 A serious weed in some areas, such as on Rangitoto Island. Listed on the National Pest Plant Accord (see Introduction for details). Rhamnus Gr. name for a shrub; alaternus Lat. name.